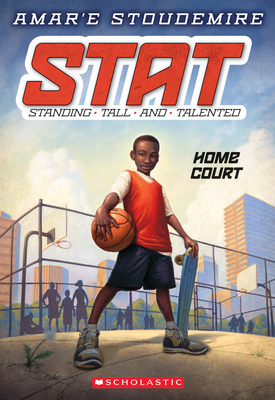 STAT: Standing Tall And Talented-- A slam-dunk new fiction series from NBA superstar Amar'e Stoudemire! Eleven-year-old Amar'e Stoudemire has a lot going on. He loves to go skateboarding in the park. He takes his school work very seriously. He helps out with his dad's landscaping company. And he likes to play basketball with his best friends-but just for fun. When a group of older kids start disrespecting his boys on their neighborhood basketball court, there is only one solution. Amar'e must step in and use his athletic ability and intelligence to save the day. This experience leads Amar'e to realize that basketball is his true passion. Based on the life of All-Star NBA sensation Amar'e Stoudemire, who overcame many obstacles to become one of the most popular figures in sports today. Amar'e is just as versatile in his off the court life as he is on. He is devoted to several charities. He promotes literacy and education. He is a media darling. And he has an amazing story to tell in this heartfelt, accessible middle-grade series. Amar'e Stoudemire, Captain of the New York Knicks and a six-time NBA All-Star, is a well-respected professional basketball player who has left his mark on the game and the community through his award winning outreach. He is focused on creatively inspiring youth to avoid poverty through education. He is the father of three children.